All dogs have their strengths and weaknesses. While some pups glide through the water as gracefully and effortlessly as Michael Phelps, others flounder (pun definitely intended). The breeds on this list may still be able to enjoy the water, but they should definitely do so while wearing a life vest! These sad-looking hounds have large heads, dense bone structure, long, thick torsos and disproportionately short legs, making swimming very difficult. In addition to their non-buoyant bodies, Bassets also have long, floppy ears that trap water and provide the perfect environment for infection-causing yeast and bacteria. While they love to play and can be quite agile on dry land, Basset Hounds simply aren’t built for water sports! Don’t let all those videos of surfing Bulldogs fool you! These guys have excellent balance, but their huge heads, deep chests, dense bodies, and short legs make it difficult to stay afloat unaided. In addition, Bulldogs are brachycephalic, and prone to breathing difficulties – especially during exercise. Hot weather, overexertion and water inhalation can all cause major problems for these short-nosed pups. If you would like your Bulldog to join you at the beach or by the pool, make sure he wears a life vest and is monitored closely for signs of distress. Frenchies have all the same physical limitations of their English Bulldog cousins, albeit to a lesser extent. Although they are slightly better equipped for the doggy paddle, they too should be closely monitored and have access to a flotation device. Built like a tiny Bulldog, the Pug has all the same body traits, which means he is not built for swimming either. Another brachycephalic breed, the Pug has a short snout, narrow nostrils and an elongated soft palate that can block the airway during exercise or excitement. 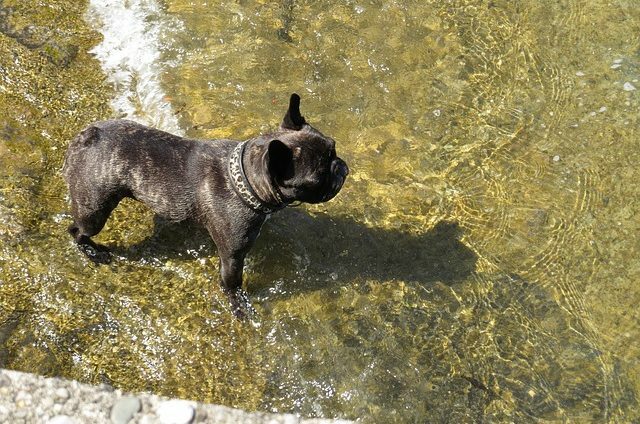 These respiratory problems make swimming difficult, but Pugs and other brachycephalic breeds face yet another challenge in the water. Because their faces are flat, they must tilt their heads far back to ensure their noses and mouths stay above the water line. This causes their body to become vertical rather than horizontal, meaning they must paddle even harder to keep from sinking. 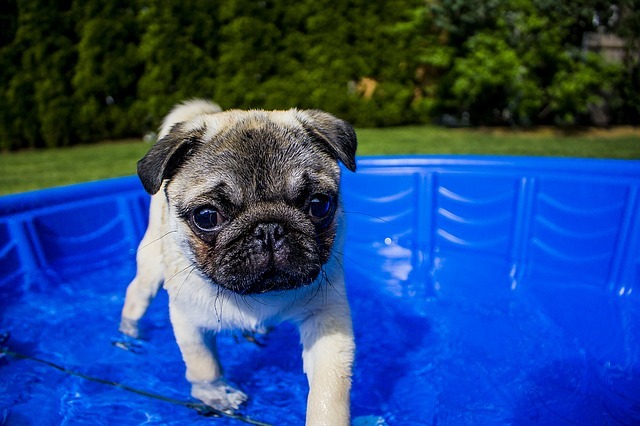 If your Pug will be joining you poolside, a life vest is a must! These sassy little hot-dogs are remarkable athletes on land, but their skills do not transfer to the water. Doxies are relatively lightweight with longer muzzles, so they do not face the respiratory issues that affect Brachycephalic breeds. 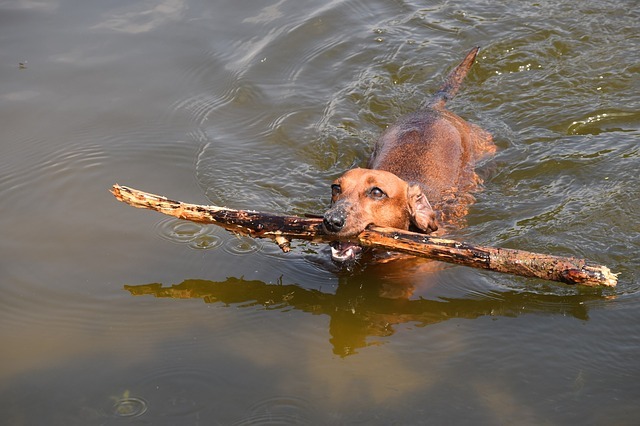 However, their long bodies and short legs mean that Dachshunds must work extremely hard and exhaust quite quickly when swimming. This poor endurance combined with their short stature makes drowning a very real risk – even in shallow water. Since Doxies love to run and jump, why not try a yard sprinkler to keep your hot-dog safe, cool and happy this summer? This poor little pooch has a flat, brachycephalic facial structure and short legs, making unaided swimming extremely risky. 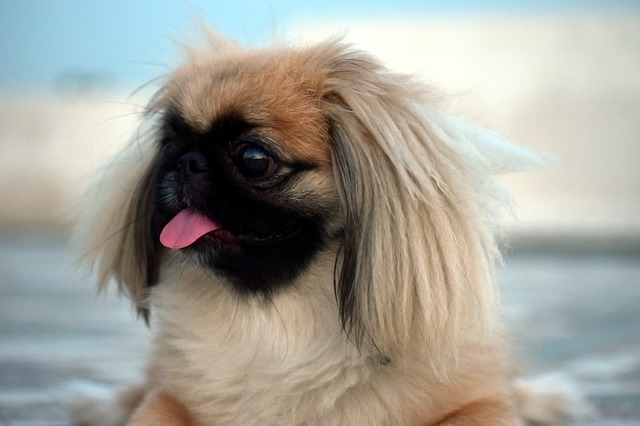 In addition, Pekingese are not particularly strong, muscular or athletic and tire quickly during exercise. 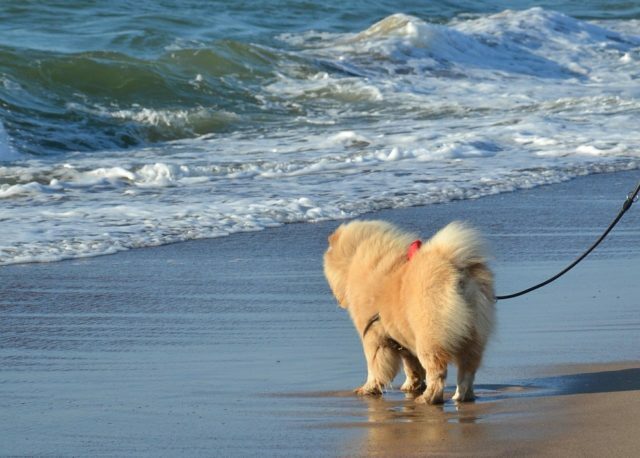 Should you decide to bring your Peke along for a day at the beach or pool, be hyper-vigilant! Provide plenty of shade and fresh drinking water to stave off heat stroke, monitor him closely to prevent over-exertion or falls into the deep end, and of course, fit your pooch with a life vest! With their long legs and powerfully muscled bodies, Boxers may look like natural born swimmers, but they are predisposed to many of the same respiratory problems as their smaller, flat-faced cousins. 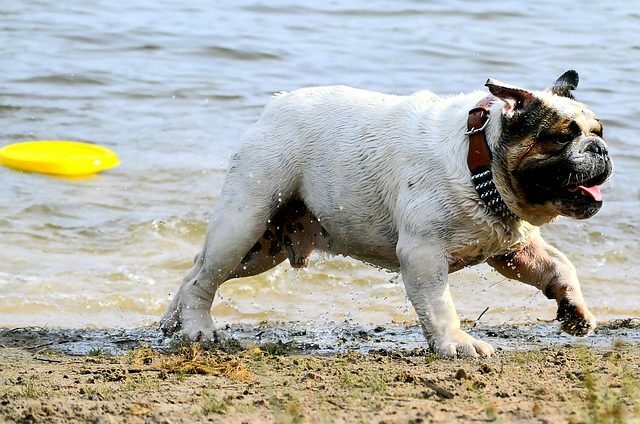 This breed is considered brachycephalic, so they may struggle to keep their noses and mouths above water or face respiratory distress and over-exertion if left to swim for too long. 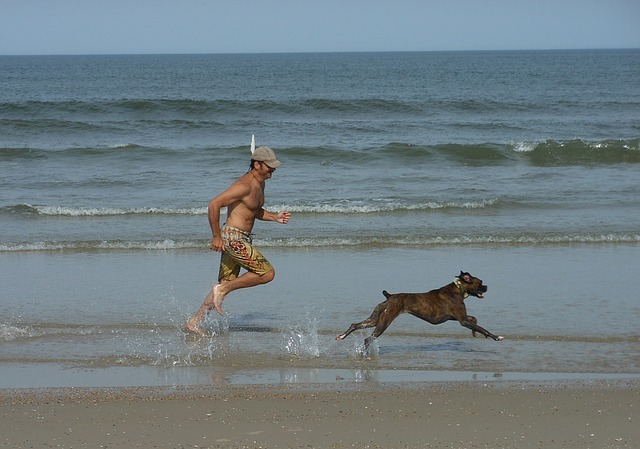 The good news is, Boxers love to run and splash in the shallows, so a kiddie pool, a sprinkler or a game of fetch along the shore should keep them happy! Corgis may be short and stout, but they are also very athletic and powerful – on land, that is! Originally bred to herd sheep and cattle, these confident little dogs may think they have what it takes to stay afloat. However, their dense, barrel-shaped bodies and short legs are just not cut out for water sports. 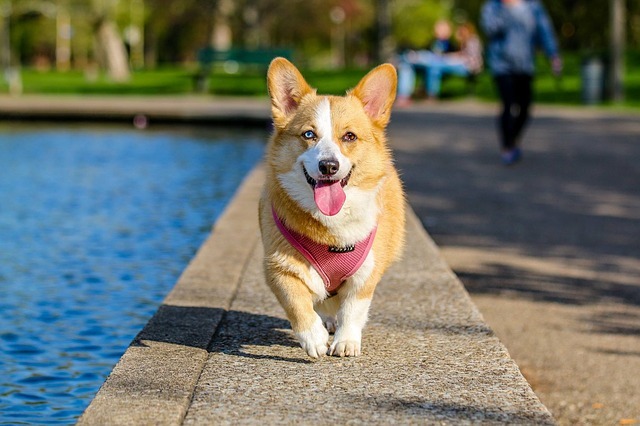 Your Corgi can still enjoy splashing in the shallows, wading in a kiddie pool, or sniffing the sea air from the safety of your boat – while wearing a life vest, of course! The athletic, fun-loving Bull Terrier is up for anything! Unfortunately his dense, solidly muscled body paired with his short legs can make swimming a challenge. 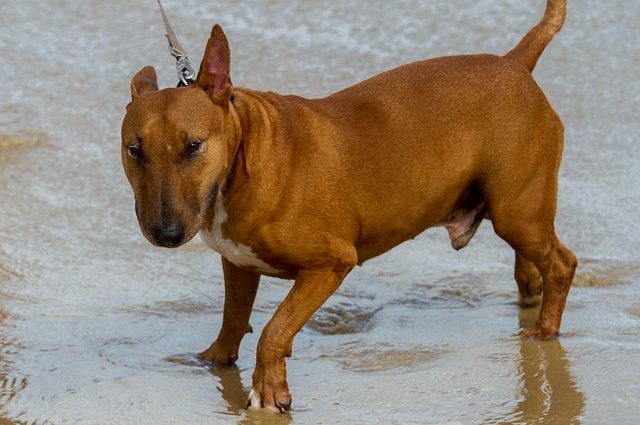 In addition, the Bull Terrier has a large, heavy head that tends to be disproportionate to his body, making it difficult to hold above water as he paddles. Not only are Shih Tzus short-legged and flat-faced, they also have thick, dense coats that can weigh them down in the water or cover their face, making breathing harder. Since they are not cut out for swimming, these little dogs may panic in the water, increasing their risk of drowning. 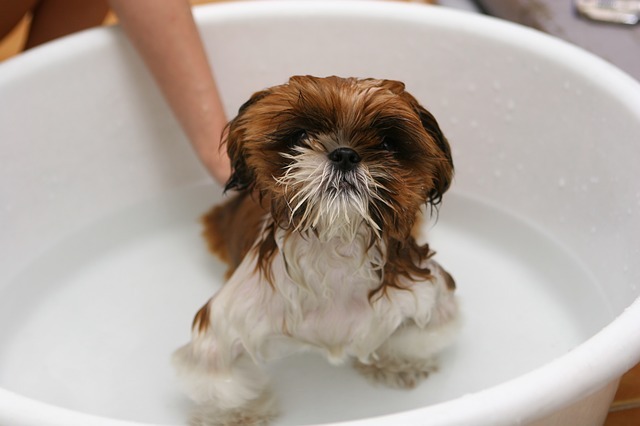 Do not force your Shih Tzu to join you in the pool, but if he or she is interested, be sure to use a life vest and watch closely for signs of distress. The poor Chow has just about every challenging feature on this list! With his thick, dense coat, deep chest, short legs and flattened muzzle, the Chow is prone to over-exertion, respiratory distress and water-logging. Add in their notoriously stubborn nature and you have a potential seaside disaster! Shar Peis have shorter muzzles, narrowed nostrils and may even suffer from Brachycephalic Airway Syndrome. In addition to their potentially serious respiratory problems, their wrinkly skin and short, tight ears trap moisture and are notoriously prone to infections. 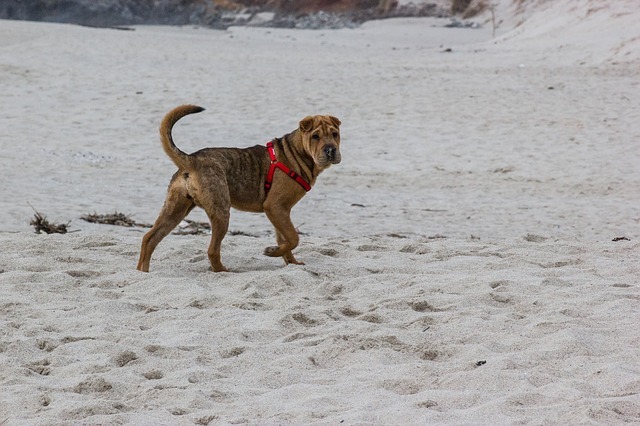 Romping in the sand is a much safer choice for these pups! If you do not see your dog’s breed on this list, it does not necessarily mean swimming is safe for them. There are several water-related hazards that can affect even the most buoyant pups. Large waves, powerful currents, aquatic creatures, hot sand, sharp shells and pool chemicals can all pose a threat. There is also the risk of water intoxication, heat stroke and sheer exhaustion. Senior dogs and those with physical limitations or disabilities are especially susceptible to water emergencies. Plan carefully before including your pooch in your pool or beachside activities!